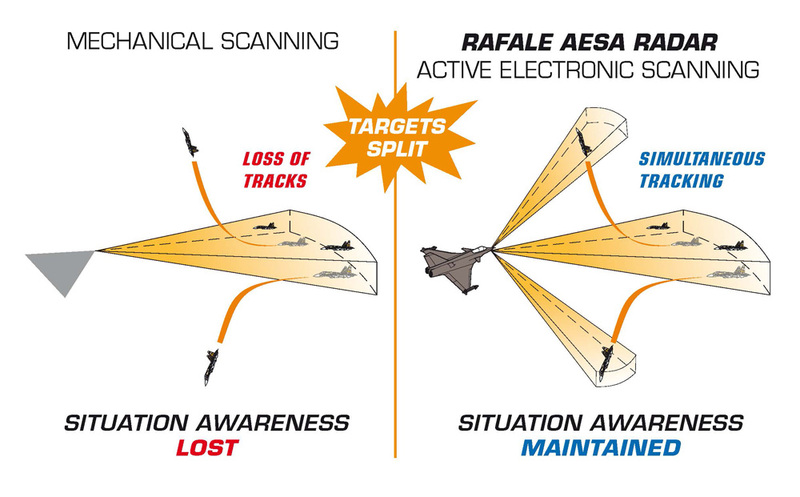 The RAFALE AESA radar is the most advanced fighter radar in its category. The AESA (active electronically scanned array) brings superior detection and tracking range, electronic scanning agility and the ability to track targets in or out of the search domain, and very high resolution ground mapping with synthetic aperture radar (SAR) modes. The RAFALE AESA radar also allows very low altitude flying above uncharted terrain in autopilot-coupled modes in blind conditions. Electronically scanned array radars which are designed to track all groups of targets, can “track while search” (tracking is performed at an optimised update rate and even outside of the search volume), when mechanically scanned array radars can only track some targets inside the search volume and update them at the scanning rate. 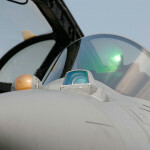 The RAFALE is the first operational – and so far, the only – European combat Aircraft to use an electronic scanning radar. Developed by THALES, the RBE2 radar has benefited from a massive research effort and from THALES’ unmatched know-how based on past experience. Compared to radars with conventional antennas, unprecedented levels of situational awareness are attained with earlier detection and tracking of multiple targets. With its superior beam agility and its enormous computing power, the RBE2 offers outstanding performance that cannot be replicated by mechanical scanning radars. Detection and tracking of multiple naval targets. The RBE2-AESA is fully compatible in terms of detection range with the upcoming long range METEOR air-to-air missile. The internal Front Sector Optronics (FSO) provides a tele-lens picture of the target (ground or airborne) with range measured by the incorporated laser. 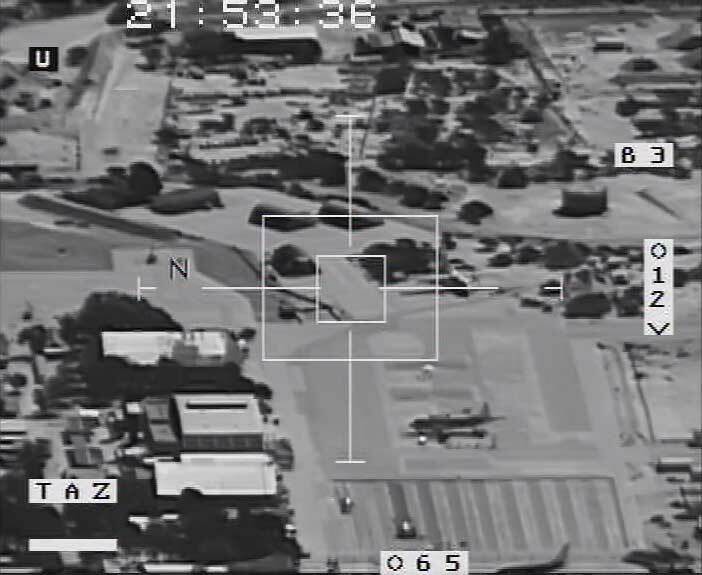 The covert approach capability of the FSO is especially valuable in air policing and intercepts, where the TV picture of the target provides early visual identification and detection of suspect manoeuvres. Developed by THALES, the “Front Sector Optronics” (FSO) system is fully integrated into the Aircraft. Operating in the optronic wavelengths, it is immune to radar jamming and it provides covert long-range detection and identification, high resolution multi-target angular tracking and laser range-finding for air, sea and ground targets. With its narrow field, the visible waveband capability is truly valuable to identify targets in situations where visual contact is required by the rules of engagement. SPECTRA is a fully internal electronic warfare system that leaves all the stores points available for weapons, fuel tanks or pods. Jamming of radar, laser and missile threats and decoying with chaff and flares, are performed according to the latest intelligence available at mission launch time. Spectra is fully integrated into the mission system, providing threat geo-location and identification data to the data fusion process. 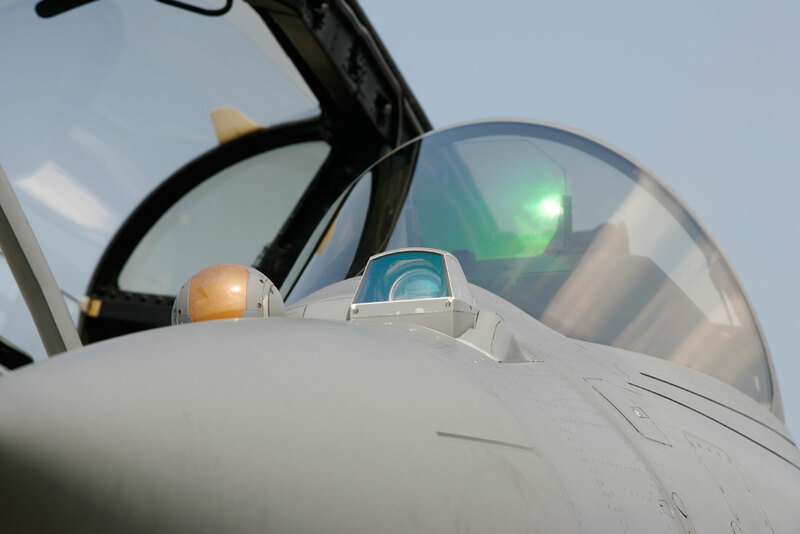 Jointly developed by THALES and MBDA, the SPECTRA internal “Electronic Warfare” (EW) system is the cornerstone of the RAFALE’s outstanding survivability against the latest airborne and ground threats. It is fully integrated with other systems in the Aircraft, and it provides a multi-spectral threat warning capability against hostile radars, missiles and lasers. The SPECTRA system carries out reliable long-range detection, identification and localisation of threats, allowing the pilot to instantly select the most effective defensive measures based on combinations of radar jamming, infrared or radar decoying and evasive manoeuvres. The angular localisation performance of the SPECTRA sensors makes it possible to accurately locate ground threats in order to avoid them, or to target them for destruction with precision guided munitions. 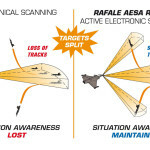 The outstanding capability of SPECTRA regarding airborne threat localisation is one of the keys of the RAFALE’s superior situational awareness. Also instrumental in SPECTRA’S performance is a threat library that can be easily defined, integrated and updated on short notice by users in their own country, and in full autonomy. Data links allow sharing a common tactical picture between wingmen, and between the formation and command and control centres. They bring superior situation awareness to all participants, encompassing air, sea and ground components of the forces. Through the data fusion process, they bring even more to the RAFALE, actually placing it in a different league with a true battle management capability. The net-centric capability of the RAFALE hinges on its open architecture, its data fusion software and its compatibility with a variety of data links, which “plug” the RAFALE into the integrated battlespace. A secure high-rate data link is provided to share data in combined air operations in real time with other Aircraft in the formation, airborne and surface command and control centres, tactical air controllers or other friendly assets. The Link 16 data link is also available to those customers cleared to operate it. As a net-centric capable asset, the RAFALE can exchange images. The Rover (“Remotely Operated Video Enhanced Receiver”) is an element of this capability which allows aircrews and forward air controllers on the ground to share videos or images of the target. It helps prevent blue-on-blue incidents and collateral damage, a decisive advantage in peacekeeping operations. The RAFALE’s interoperability, as part of a multinational operation, has been demonstrated on countless occasions, and link 16 as well as non-nato solutions can be provided to meet various customers’ requirements. The DAMOCLES laser designator pod designed by THALES, brings full day and night laser designation capability to the RAFALE, with metric precision. It permits laser-guided weapons to be delivered at stand-off range and altitude. The IR sensor of the DAMOCLES pod operates in the mid-wave infrared band, allowing it to retain its effectiveness in warm and / or humid conditions. DAMOCLES is interoperable with all existing laser-guided weapons. For both strategic and tactical reconnaissance missions, the French armed forces have adopted the new generation THALES AREOS reconnaissance system for the RAFALE. This high-tech, day and night equipment can be used in a wide range of scenarios, from stand-off distance at high altitude down to high speed and extremely low-level. To shorten the intelligence gathering cycle and accelerate the tempo of operations, the AREOS pod is fitted with a data link which allows high resolution images to be transmitted back to military decision makers in real time. The outstanding performance of AREOS in stand-off reconnaissance makes it a sensor with a true pre-strategic value. 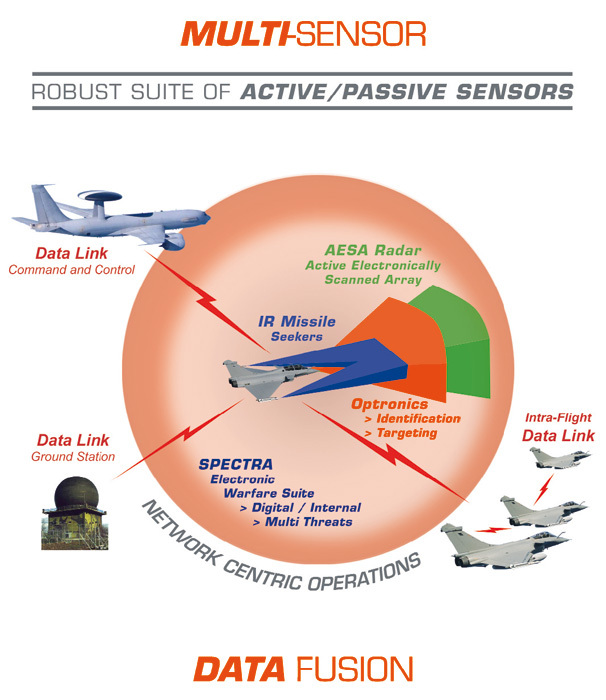 Based on the processing power of the MDPU modular mission computer, the data fusion performs the number crunching on data provided by the AESA radar, the FSO optronic system, the SPECTRA electronic warfare system, the data links, the IFF (friend-foe identification) interrogator and the infra-red missile seekers. 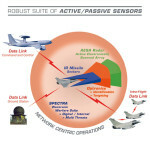 The data fusion yields a simplified and consolidated tactical picture, showing correlated system tracks rather than separate sensor and data link tracks. 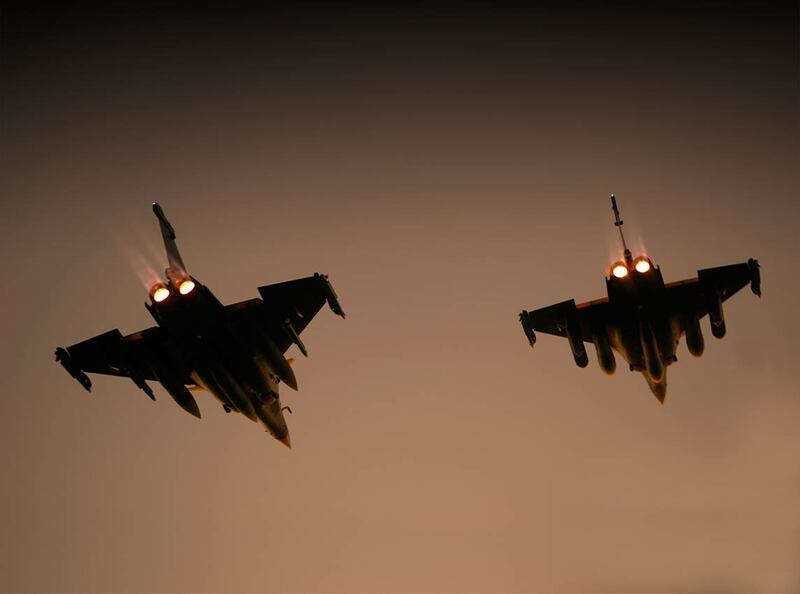 Workload alleviation, clarification of the tactical situation and fratricide risk reduction are the most immediate benefits for the RAFALE pilot. Implementation of the “multi-sensor data fusion” into the RAFALE translates into accurate, reliable and strong tracks, uncluttered displays, reduced pilot workload, quicker pilot response, and eventually into increased situational awareness. 3. Assessing the confidence level of consolidated tracks, suppressing redundant track symbols and decluttering the displays.